Over the years, many articles have been written about the early orchid collectors, the nurserymen who employed them, and the orchid species that these nurserymen introduced to cultivation. They were exciting times, particularly the second half of the nineteenth century, when orchid growing was largely confined to the wealthy British upper classes. New orchids were being discovered every month, the more spectacular examples being reported in the major newspapers of the day. The occasional death of an orchid’s collector due to misadventure or some exotic tropical disease just added spice to the story! Gradually I have come to realise that some of the colourful accounts that appeared in those times should be taken with the proverbial ‘grain of salt’. Yes, the orchid’s features – its colour, shape and size – could be taken at face value but details as to how and where it was found were, for various reasons, not always true. It was not in the best interests of a collector or his employer to reveal the source of any spectacular discovery. To do so would enable rival collectors to procure what was otherwise an exclusive valuable resource. It was not easy to conceal such information, as many collectors resorted to industrial espionage, by bribing their rival’s bearers to reveal the route followed or by following their rival’s footsteps. Back in Britain, some nurserymen deliberately provided misinformation as to where their more spectacular orchids were found. For example, Frederick Sander let it be known that his collectors had found the magnificent Paphiopedilum rothschildianum in New Guinea, a myth that was perpetuated for many years thereafter. Its true source was eventually revealed as the island of Borneo, in particular Mount Kinabalu and its surroundings. Unfortunately, few orchid collectors of those times wrote about their travels – some because they were not sufficiently literate, others because they died before they had a chance to do so! Most were urged to write frequent letters to their employers but, in Frederick Sander’s opinion, few provided sufficient detail. The nurserymen then used such information to publicise their new orchids. Not surprisingly, it was sometimes embellished in the hope of inciting greater interest and therefore higher prices! Journalists and other writers also used this information, often with further embellishment, for their Journalists and other writers also used this information, often with further embellishment, for their articles in magazines such as the Gardener’s Chronicle or the regular daily newspapers. One of the most prolific British orchid journalists of the day was Frederick Boyle. His articles were published in the popular press, and later released in book form, the most well known being About Orchids: A Chat (1893). Unfortunately Boyle was prone to exaggeration, if not fabrication, and it is now known that some of the material in his stories was pure invention. For example, in an article (The Lost Orchid) about Cattleya labiata, discovered by William Swainson in 1817 or 1818, he wrote “The orchids fell in his way – possibly collected in distant parts by some poor fellow who died at Rio. Swainson picked them up, and used them to pack his lichens”. Thus the myth arose that Cattleya labiata reached William Cattley (after whom the genus was named) as packing material for a box of ferns. In fact, William Cattley was an accomplished orchid grower known to Swainson, who had deliberately sent the orchid to Cattley (via the Glasgow Botanic Gardens). The source of Cattleya labiata was a mystery for many years. Although Swainson discovered it during his journey through Brazil in 1817-1818, its source was not revealed at the time. George Gardner thought that he had rediscovered it growing near Rio de Janeiro in 1836, but that species was eventually identified as C. lobata. It was not until 1900, when Swainson’s account of his journey (written in 1846) was rediscovered, that the true source of C. labiata was revealed as the Brazilian state of Pernambuco, over 1500 km from Rio de Janeiro! 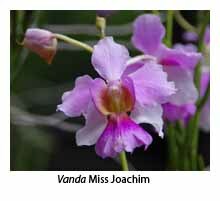 Another myth, which I was once guilty of helping to propagate, concerns the origins of Vanda Miss Joaquim. 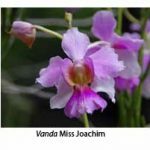 In his book A Joy Forever (1982), which celebrates the adoption of Vanda Miss Joaquim as the national flower of Singapore, Teoh Eng Soon concluded that the orchid was a natural hybrid found by Miss Joaquim in a clump of bamboo in her father’s garden. In reality, the respected botanist Henry Ridley, one time Director of the Singapore Botanic Gardens, had written in the Gardener’s Chronicle for 1892: “A few years ago, Miss Joaquim, a lady residing in Singapore, well-known for her success as a horticulturalist, succeeded in crossing Vanda Hookeriana Rchb.f. and V. teres.” It seems clear from this statement that Vanda Miss Joaquim was intentionally made and that it was not a natural hybrid. I conclude with a warning: remember that not all you read is true, perhaps not even in Orchids in Victoria Revisited! Chadwick, A.A., Orchids (Journal of the American Orchid Society), 2003, 38-47. Swinson, Frederick Sander: The Orchid King, Hodder & Staughton, 1970. F. Boyle, About Orchids: A Chat, 1893. Teoh Eng Soon, A Joy Forever – Vanda Miss Joaquim, Times Books Int., 1982.